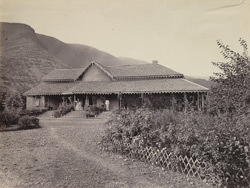 Photograph of a bungalow in Abbottabad, now in Pakistan, from the Macnabb Collection, taken by an unknown photographer in 1865. This is a view from the garden of a bungalow showing a European woman and servant standing on the verandah. The caption on the verso of the photograph reads 'Captain Mackenzie's house at Abbottabad'. Abbottabad was founded in 1853 by Major James Abbott, the first Deputy Commissioner of the Hazara District (1847-53). Now in Pakistan, the Hazara District runs from the Himalayas in the north and towards Rawalpindi in the south.